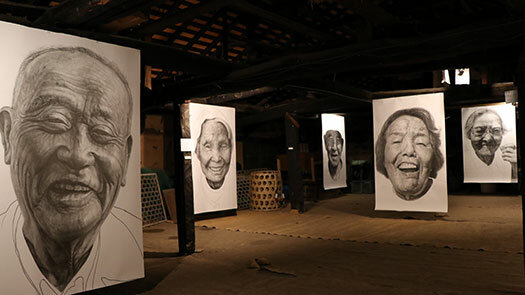 These large scale pencil drawings show the faces of elderly agricultural workers from Gunma Prefecture, Japan. Having carried out this physical work for such a long period of time, these people have developed their own deep, meaningful relationships with the land. The marks and lines on their faces, earned from years of working in the fields, become a type of record of the landscape. The artist uses this monumental scale to examine all of these people in intricate detail, to show the many years of their lived experience. Kosuke Iizawa is a visual artist from Yokohama, Japan, now based in Tokyo, Japan. In 1994 he graduated from Tokyo National University of Fine Arts and Music’s postgraduate programme, and regularly exhibits in Japan and internationally.